Record-breakingly close flybys of two comets earlier this week. 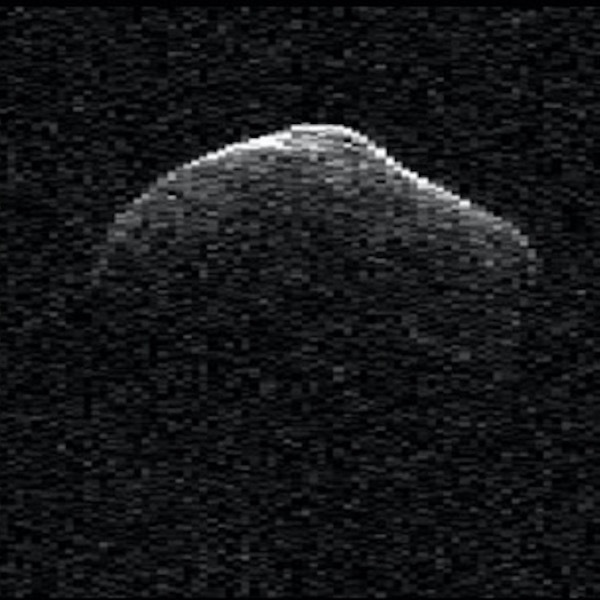 Radar images of one, the closest comet in 246 years. Will the other be visible to the eye? UPDATE MARCH 25, 2016. Two small comets swept by Earth this week (March 21 and 22, 2016). Comet P/2016 BA14 – closest comet in 246 years – been observed using radio signals that bounced off the celestial visitor. Meanwhile, the other comet – Comet 525P/LINEAR, 5th closest known comet in recorded history – is in Southern Hemisphere skies now, but will return to Northern Hemisphere skies by the end of this month. Will it still be visible using binoculars? We will find out very soon; just remember that comets have shown to be unpredictable. 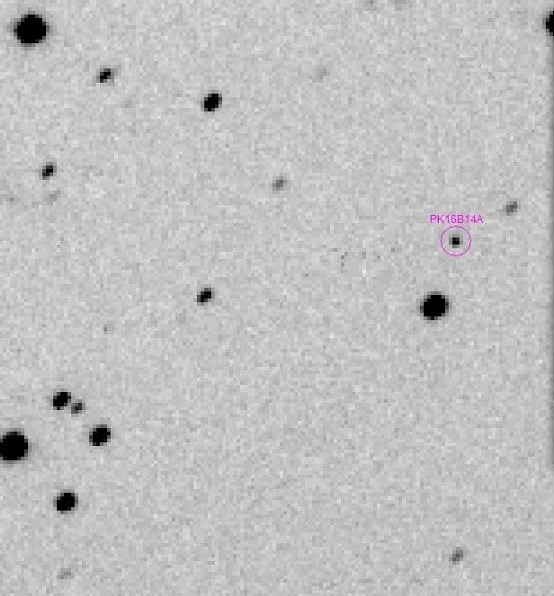 Meanwhile, it’s still thought that Comet P/2016 BA14 may be a fragment of 252P/LINEAR, which is about twice as big and shares a very similar orbit. Will you see Comet 252P/LINEAR? Were these two comets once a single comet, that split? What were the closest comets in recorded history? Composite image of the record comet P/2016 BA14 Panstarrs meeting the M106 galaxy, as seen from our perspective, on March 24. 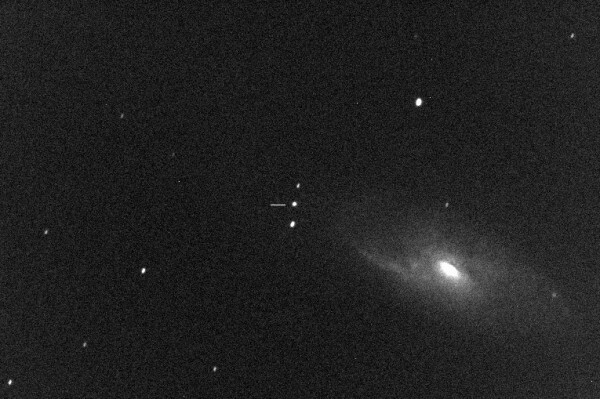 Image via Gianluca Masi, Virtual Telescope Project – Italy. Radar observations of Comet P/2016 BA14 (Pan-STARRS). This small comet passed Earth on March 22, 2016. It came within about 9 lunar distances, from Earth. That’s very close for a comet. In fact, this comet – P/2016 BA14 – set a record as the third-closest known comet to pass our planet in recorded history and the closest comet in 246 years! Astronomers do see a lot of asteroids coming even closer to Earth, but … comets are different. We measured the spectral and thermal properties of the comet using the NASA IRTF and found that the comet reflects between 2-3 percent of the sunlight that falls on it. This is typical for comets. Based on its reflective properties, Reddy estimates the size of the comet to be between 600 meters and 1.2 kilometers (0.4 miles and 0.75 miles) in diameter. The radar images show that the comet has an irregular shape: looks like a brick on one side and a pear on the other. The new radar observations suggest comet P/2016 BA14 spin around its axis once every 35 to 40 hours. The comet was also seen in infrared. Using NASA’s Infrared Telescope Facility on Mauna Kea, Hawaii, astronomer Vishnu Reddy, of the Planetary Science Institute in Tucson, Arizona, found comet P2016 BA14 reflects less than 3 percent of the sunlight that falls on its surface. View larger. 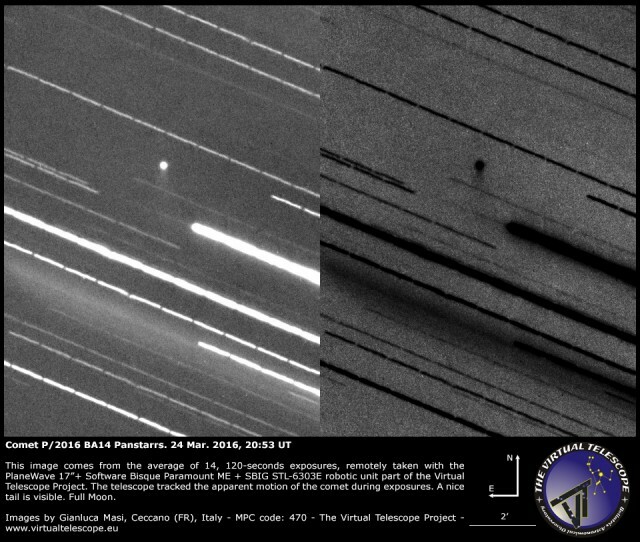 | Although most images show Comet P/2016 BA14 with an asteroid appearance, this one taken on March 24, 2016 shows a small tail. Credit: Gianluca Masi, Virtual Telescope Project – Italy. Although Comet 252P/LINEAR is currently visible to Southern Hemisphere observers, it will return to Northern Hemisphere skies by the end of this month. 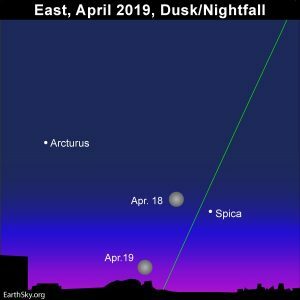 This illustration shows the position of the celestial visitor on March 27, about 45 minutes before sunrise as seen from central U.S. Illustration by Eddie Irizarry using Stellarium. 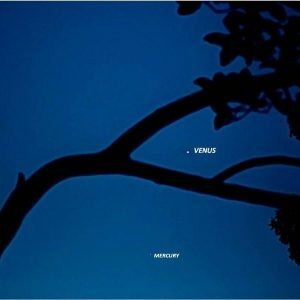 Will you see Comet 252P/LINEAR? Comet 252P/LINEAR passed on March 21, 2016, as the 5th closest comet in recorded history. It is thought to be larger than BA14 and so has been brighter. In fact, it became unexpectedly bright a few weeks ago, brighter than astronomers had predicted, but still not visible to the unaided eye. Observers have recently reported it’s been visible using binoculars. There are even some reports of naked eye visibility from very dark skies on the southern hemisphere. 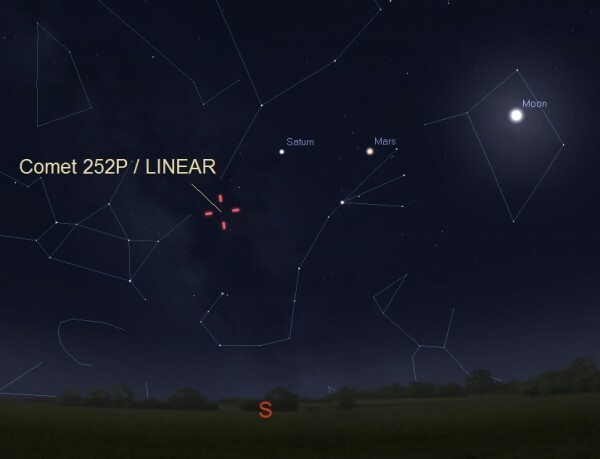 Although the sky show is currently visible only to Southern Hemisphere observers, this comet will return to Northern Hemisphere skies around March 26-27. The comet was predicted to reach a brightness of around magnitude 11. But, in recent weeks, it has gradually brightened. Comet 252P/LINEAR was closest to the sun on March 15, 2016. When it swept closest to Earth on March 21, its distance was a record-breaking 3,290,000 miles (5.3 million km). This is about 14 times the Earth-moon distance. View larger. 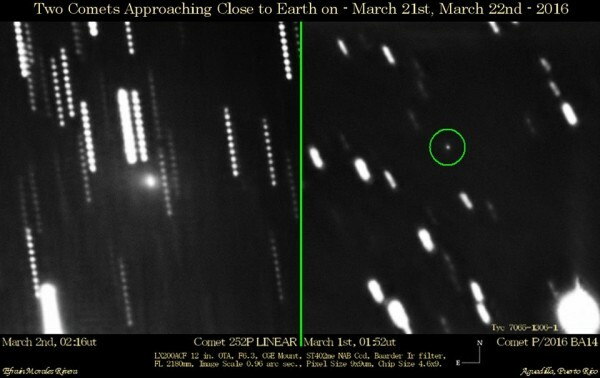 | Comet 252P/LINEAR is safely flying past Earth on March 21, 2016, at a range of about 3.3 million miles (5.2 million kilometers). On March 22, comet P/2016 BA14 safely sweeps past by our planet at a distance of about 2.2 million miles (3.5 million kilometers). Image via NASA/JPL-Caltech. Were these two comets once a single comet, that split? Comet 252P/LINEAR and Comet P/2016 BA14 follow an unusually similar orbits. Coincidence? Maybe not. It could be an indication of twin nature of the comet pair. 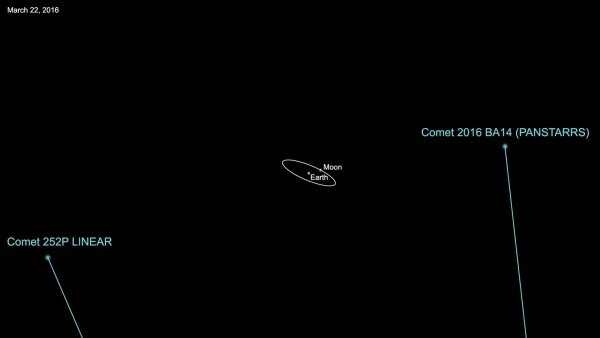 NASA points out that Comet P/2016 BA14 is roughly half the size of Comet 252P/LINEAR and might be a fragment that calved off sometime in the larger comet’s past. Comet P/2016 BA14 is possibly a fragment of 252P/LINEAR. The two could be related because their orbits are so remarkably similar. We know comets are relatively fragile things, as in 1993 when Comet Shoemaker-Levy 9 was discovered and its pieces linked to a flyby of Jupiter. Perhaps during a previous pass through the inner-solar system, or during a distant flyby of Jupiter, a chunk that we now know of as BA14 might have broken off of 252P. 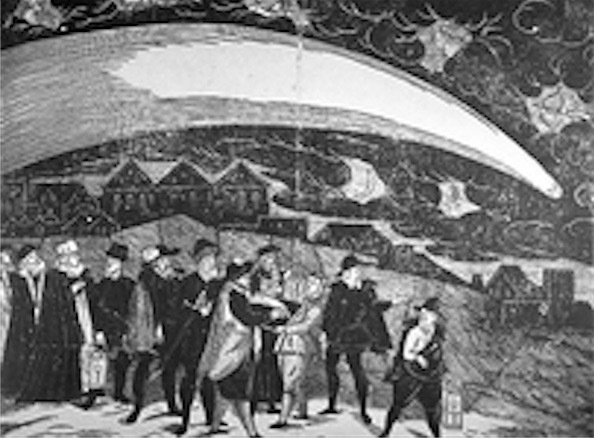 In 1770, Lexell’s Comet passed closer to Earth than any other comet in recorded history. 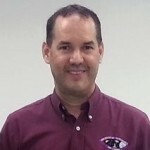 First place goes to Comet D/1770 L1 (Lexell). Comet Lexell went at just 5.9 lunar distances on July, 1770. That was about 1,410,100 miles (2.3 million km), so close that Charles Messier noted the comet’s coma looked about the size of four times the apparent size of a full moon. Second place goes to Comet 55P/1366 U1 (Temple-Tuttle). According to astronomers’ calculations, it passed by Earth on October, 1366, at 8.9 lunar distances. Third place currency goes to Comet C/1983 H1 (IRAS-Arak-Alcock)… but that’s about to change. In May, 1983, this comet passed at 12.2 lunar distances. Now Comet IRAS will step down to become the fourth-closest after the upcoming flyby on March 22 by the Comet P/2016 BA14 (about 9 lunar distances). Since comet IRAS passed at 12.2 lunar distances, the upcoming flyby of P/2016 BA14 will be the closest flyby of a comet in 246 years! Comet 252P/LINEAR photographed on March 10 by Efrain Morales of the Sociedad de Astronomia del Caribe. This photo shows comet 252P/LINEAR on March 2 (left) and small comet P/2016 BA14 on March 1 (right). 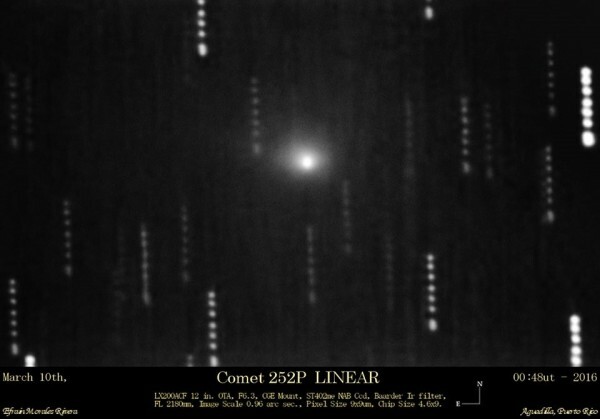 The twin comets were captured using a 12″ diameter telescope by Efraín Morales of the Sociedad de Astronomia del Caribe. Photo of comet P/2016 BA14 by Steven M. Tilley using the iTelescope.net Observatory in Siding Spring, Australia. Copyright Steven M. Tilley. Used with permission. 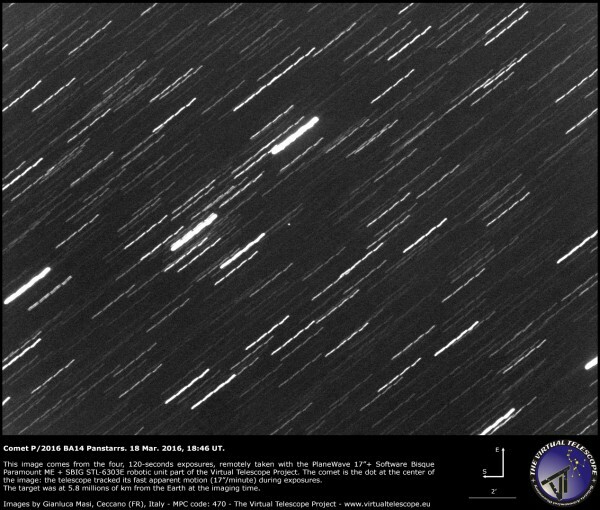 Comet P/2016 BA14 on March 18, 2016 via the Virtual Telescope Project. Read more about this image. Bottom line: Record-breakingly close flybys of two comets earlier this week. Radar images of one, the closest comet in 246 years. Will the other be visible to the eye?